Each of these shortages varies by country. U.S. employers reported a major increase in hiring difficulties, jumping from 32% in 2015 to 45% reporting hiring difficulties in 2016. Employers from the EMEA region (Europe, the Middle East and Africa) faced the highest levels of hiring shortages since 2006. In each major region except for Asia Pacific, skilled trade jobs, such as mechanics and electricians, were cited as the hardest to fill. In response, ManpowerGroup offers several solutions for employers. One of those tips is to “foster a learning culture and encourage employees to own their careers.” The advice is reciprocal: Provide chances for your employees to grow, and they’ll be even more trained and motivated to work for your company in return. It’s the kind of relationship that fits well with education – whether for your employees or students in the community. And for those seeking positions in the skilled trades, a career and technical education (CTE) provides a wealth of opportunities. 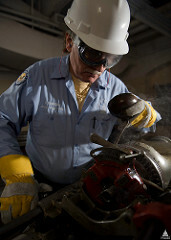 Help your workforce grow with Scholarship America’s CTE options. Contact us today! How Can Career and Technical Education Benefit Your Company? With CTE so flexible, there are just as many options to help make that education possible. Your business may already have training for your workers, but you may be interested in expanding awards to children of employees. For more in-depth learning, you could offer a tuition assistance benefit, where employees study at an outside program depending on eligibility requirements. Still other programs are geared toward the general public, supporting deserving students and highlighting your organization’s focus on community. As an example, the Scholarship America Dream Award is a renewable scholarship that’s good for two-year, four-year or vocational-technical schools, covering a wide range of studies while recognizing the value of CTE.Skilled trades are getting a boost from the federal government, too. In January 2015, President Barack Obama urged the private sector to lead the charge in increasing opportunities for workers to advance in their careers. More than 30 large companies committed to that call, which include launching new apprenticeship programs and supporting workers as they pursue their postsecondary degree. In September 2015 President Obama announced $175 million in apprenticeship grants to continue “earn and learn” training for more than 34,000 new apprentices in high-growth, high-tech industries. With this renewed push toward an educated middle class workforce, employers can make the most of this momentum – especially as ManpowerGroup’s survey also found that more than one in five employers is not pursuing any strategies to address talent shortages in their workplace. The need for skilled labor, and the concerted effort in the U.S. to fill that demand, means there’s lots of potential to make a difference for current and future workers. If you’re interested in starting a CTE program, contact us! Scholarship America offers education assistance expertise to companies, foundations and individuals across the nation. We can help you make the most of your employee and education investments.